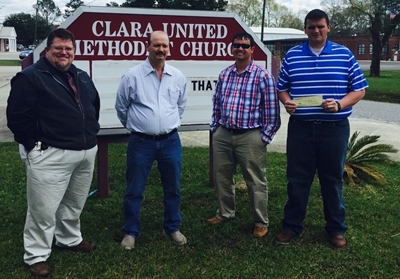 The First United Methodist church of Clara recently donated $1,150.00 to the Wayne County Sheriff's Department to assist in funding the cost of bullet proof vests for the officers. Pictured is pastor Jessie Long, James Bo Beard, Adam Beard and Investigator Jamey Beard. "I want to personally thank everyone who has contributed to help fund the cost for the safety equipment to help make Wayne County a better place for everyone. It is humbling and reassuring to know that the citizens of our county stand behind us as Law Enforcement Officers", said Sheriff Jody Ashley.